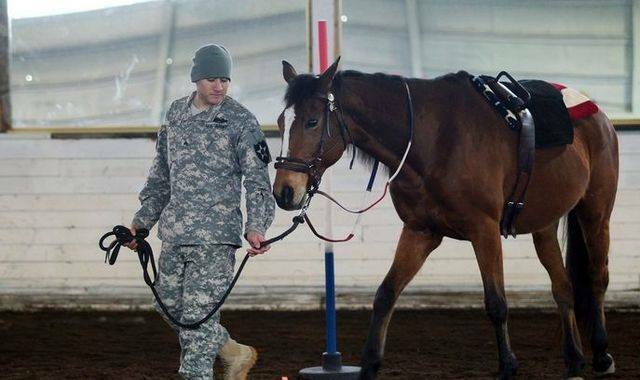 Vinceremos offers a variety of equine-assisted learning (EAL) programs for students,"at risk" youth, veterans, families in transition and corporate team building. EAL offers unique experiential learning opportunities that strengthen and develop relationships. This type of program incorporates the horse into a group or team for interactive challenges and learning activities. Participants engage in hands-on learning that includes the horse as a partner in exploring positive development of communication, self-respect, confidence, trust, accountability and conflict resolution. Sessions incorporate a variety of ground work and general horsemanship activities including grooming, leading and herd observation, as well as specially designed interactive activities and team-building exercises. The EAL program, “Taking the Reins,” can be tailored to specific individuals, populations or organizations. Classes are overseen by our PATH Intl. Certified Equine Specialist. These programs can include a collaboration with a mental health professional, teaching professionals and community volunteers. Please note that our EAL program is not a riding program, the exercises are carried out on the ground and no horse experience is required. This program is customizable for individuals, families, school groups, corporate team-building and treatment centers. Mental health professionals, if you are interested in partnering with us to offer your clientele the unique benefits of Equine Assisted Therapy, please contact the office for more information.